No doubt billed as a dreaded ‘team-building exercise’, the England U21s were shown around Colchester Army barracks this week, and even got to hold some real guns. Drill sergeant Stuart Pearce seemed to be taking it very seriously, but then if you’ve been in the military like wot I have, you’ll know that you never point a gun at anyone, EVEN IN JEST! … unless you’re trying to kill them, that is. 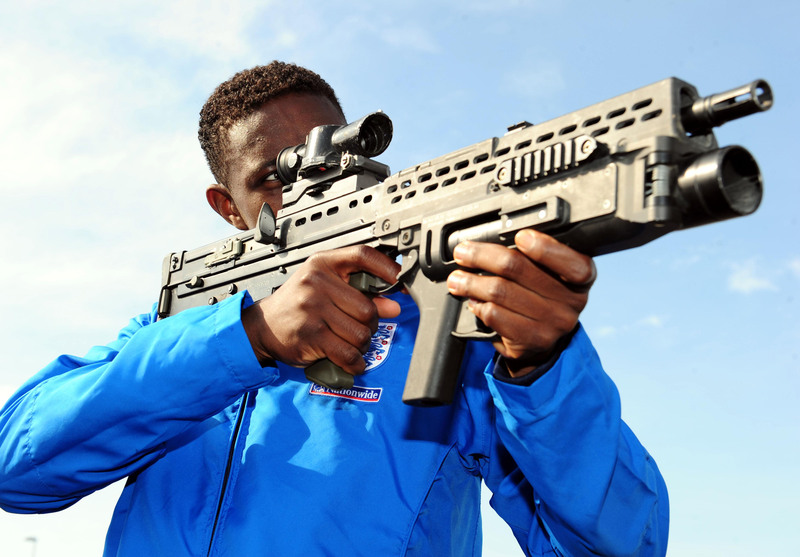 England's U21 Danny Welbeck looks through a rifle during a tour of 16 Air Assault Brigade and Colchester Garrison, Colchester. Douche comment, but #6 is Bertrand not Naughton. Well numbers 4&5 are my new favourite pictures!